With more than 50 volunteers, Tri Valley Health System features an extensive volunteer program with individuals assisting at the hospital and with various projects throughout Tri Valley Health System. Volunteer Services has contributed hundreds of hours aiding Tri Valley Health System with its service to southwest Nebraska and northwest Kansas. ​The Cambridge Memorial Hospital Auxiliary's faithful service has produced hundreds of thousands of dollars for needed medical equipment and other support to the Tri Valley Health System from the Thrift Shop, a store in downtown Cambridge operated by the Auxiliary. The Auxiliary's record of giving includes a $75,000 contribution to the Tri Valley Medical Foundation, as well as contributions to every department in the hospital, local nursing homes, schools, EMTs and in support of a physician drive. To date, the Auxiliary's contributions to the medical community have totaled more than $200,000. The Auxiliary also awards an annual scholarship in memory of long-time member Maxine Price, who served for many years as the Auxiliary President. The Cambridge Memorial Hospital Auxiliary meets every other month at the Heritage Plaza. Current officers are Georgia Dutt, president; Valaire Bond, vice president; Jaccie Morgan, secretary; and Joy Deterding, treasurer. To get involved, inquire at the Thrift Shop or call 308-697-4649. If you or someone you know would like to volunteer, please fill out the form below, contact us at 308-697-3329 or email info@trivalleyhealth.com. ​Located in downtown Cambridge. 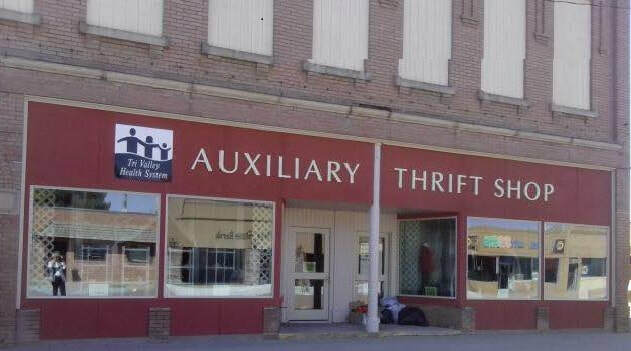 The Thrift Shop accepts donation of goods to help raise funds for the Tri Valley Medical Foundation.